We are generally not impetuous people, and the idea of abandoning a sticks-and-bricks home for an unspecified period of permanent travel is definitely one that took time to take hold of our imagination. For a few years I have been following travel blogs written by a number of full-time RV and travel trailer dwellers — some of which are listed on this site’s blogroll — in a manner which borders on stalking. In part I have been looking for ideas about travel destinations, but mostly I try to glean information about the daily life activities of a full-time traveler. Ken and I have spent hours discussing our hopes and expectations about the lifestyle, to make sure we are prepared for the significant life change that it represents. While I certainly don’t believe we have thought of everything, we are pretty confident that we’ve identified the elements of full-time travel that will be most challenging for us, and we think we are prepared to deal with them. To keep us honest, I’m making of list of our expectations, which we can revisit in the future to confirm just how bad we are at predicting the future. This picture somehow fails to capture the massive difference in size between our current and prior vehicles. Driving a giant vehicle. After 15 years as a loyal Mini Cooper driver, it was pretty startling to suddenly start driving a giant pickup capable of towing 10,000 pounds of trailer and gear. Add the trailer onto the truck, and you are now dealing with a vehicle combination with the maneuverability of a school bus. Oh, and for the first time in my life I’ll need to pay attention to the road signs that disclose maximum vehicle weights for bridges and height clearances for underpasses (never much of an issue for a Mini). This all requires learning a new style of driving which is very different from our darty, city-appropriate habits. Since our travels will take us across many rural areas, which I hope have large turnaround areas, we think we’ll manage. Our biggest dread for the first year of travel is the plan to take the trailer across the Golden Gate Bridge in November. Check back later to find out if we chicken out and find an alternate route. Using cash. We use credit cards for all our purchases (balance paid off each month, of course) and as a result rarely even carry cash. It appears that we may need to change our ways somewhat to adapt to life in the trailer. While many of the state and national parks take reservations online via Reserve America using a credit card, national forest campgrounds and county parks often require payment by check or even – gulp – exact change in bills. Chasing after exact change will be annoying, without a doubt. So will hoarding quarters to feed the laundry machines at campgrounds and laundromats. That’s a definite throwback to my college days. Also like my college days — which occurred during the height of the grunge era — I will be rocking a chic fashion style best described as Mostly Clean With No Or Very Few Holes. With such low fashion standards, laundry maintenance won’t be too much of a chore, so long as we can collect enough darned quarters. Several of the seemingly thousands of items that we donated as part of our downsizing. Not having a garbage disposal. This is the one appliance I will miss. We will have a relatively large refrigerator and stove (though not quite full size) and I plan to do at least as much home cooking as I did in our apartment. But having to develop a new habit for dealing with vegetable peelings and other food waste will require some adjustment. Being constantly in motion. We are creatures of habit, which makes unstructured full-time travel particularly daunting. One routine task that will be made much more difficult is grocery shopping. I get irked now when my local Whole Foods relocates a product a few feet away within the same section. Soon we will be dealing with shopping in a new store in a new town every week, with little predictability about whether they will stock the sometimes unusual ingredients I am accustomed to buying. I am guessing fresh organic baby bok choi, exotic mushrooms, and shallots will be in short supply in rural America, and there will not be 5-10 different preparations of curry powder to choose from in the spice section. Meal plans will need to be adjusted on the fly depending on the availability of ingredients. Dealing with weather. We currently live wholly climate-controlled lives. Outside of catastrophic events like hurricanes, the main impact of adverse weather (rain) is some minor inconvenience during my 10-minute walk to the office. Since Ken has worked from home for years, he has been almost entirely weather-independent. 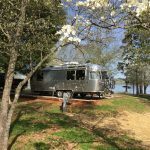 Living in the Airstream will bring us into closer connection with the natural world, and that includes being far more affected by the elements. Being trapped inside a tiny trailer for days on end or unable to tow safely because of ceaseless rain storms is an experience I am hoping to avoid as much as possible. The common thread with all of these items is that they require breaking habits. Habituation to our current lifestyle has made us more efficient — we are power shoppers at the Downtown Miami Whole Foods and rarely have to bother checking the daily weather forecast — and in our new lifestyle we will have to devote more mental energy to some tasks that have been on autopilot. To compensate for the stress created by constantly having to react to new situations, we have tried to build plenty of downtime into our schedule. I hope that having entire days devoted to long walks, reading, reflection, and writing (this blog) will give us the mental reprieves needed to handle the challenges of full-time travel with grace and aplomb. If we can’t avoid burnout, we need to change our travel style. If this is my back porch, I can deal with living in a small space. This was from our very first night of camping in the Airstream. Living in a small space. No doubt it would have been extremely jarring to move from our large suburban home directly into the Airstream. But after several years of living in a one-bedroom apartment in downtown Miami, we are comfortable living in small spaces. Actual statement, by us, regarding several areas of our <900 sf apartment: “We never even use that part of the apartment! It’s practically superfluous.” Also, we have experienced firsthand, both in Miami and in New York, the feeling of expansiveness that is created by having a narrow balcony with a great view. I am expecting that the areas around our trailer, and of course the entire offerings of the parks where we will be residing, will provide that sense of space so our small trailer will feel anything but claustrophobic. Managing resources. Our Airstream is designed to be self-sufficient for off-grid living for limited periods of time, with a solar panel array on the roof and fairly substantial tanks for holding fresh water, grey (shower and sink waste) and black (toilet waste). We will also be camping in plenty of places where we will have limited hookups, such as electric only. That means we’ll need to monitor and manage our use of electricity and water, including evaluating whether conditions are conducive to generating our own solar power. What’s that you say? An opportunity to optimize our behaviors, with actual data to back up those efforts? This will clearly become our newest obsession, and definitely not a drag at all. No dishwasher here! Photo of our trailer courtesy of Colonial Airstream, before the microwave was replaced with an oven. Not having a dishwasher. We never used the dishwasher in our apartment while living in Miami, and used it exclusively to store large pans. No worries about going without one. Spending time with each other. If you are a person who can’t spend more than a few continuous hours with your spouse without getting into a conflict, moving into a tiny aluminum tube and hitting the road together for an indefinite period of time is a terrible plan. Fortunately Ken and I very much like spending time together — and one of the most compelling aspects of this journey is the opportunity to do it with each other. When we lived in our large suburban house we could easily spend a weekend day puttering around with our own hobbies in separate areas of the house, barely interacting. Living in a one-bedroom apartment has forced us to interact much more, and it has truly deepened and strengthened our relationship. We are confident that we can tackle this adventure together and will have a great time doing it.